The wife of 58-year-old Maryland man who died two years ago during a rafting trip down the runoff-swollen Roaring Fork River filed a federal lawsuit Friday accusing the rafting company of negligence and fraud. James Abromitis, who was in Aspen with his wife for the Food & Wine Classic, died June 15, 2016, after he was ejected from an Aspen Whitewater Rafting boat two separate times in a section of Roaring Fork rapids known as Slaughterhouse Falls. “Aspen Whitewater knowingly misrepresented and concealed the nature and danger of Slaughterhouse at high water and, once on the river, then engaged in grossly negligent and intentionally reckless conduct causing James Abromitis to be twice ejected in immediate succession from the raft, resulting with him being flushed downriver to his death,” according to the lawsuit. Reached Friday, Aspen Whitewater Rafting owner Jim Ingram said he didn’t know about the lawsuit and referred questions to his Denver-based lawyer. That lawyer did not return a phone message seeking comment. 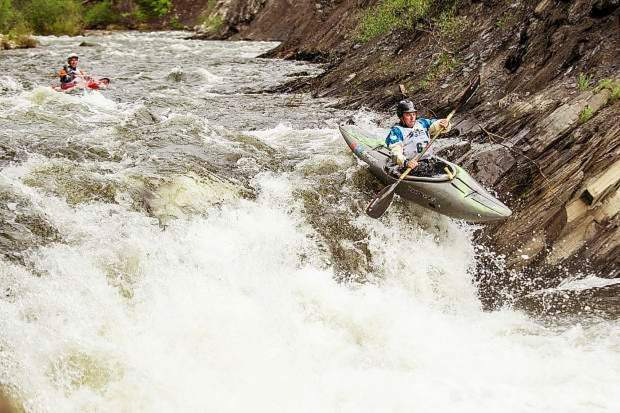 In addition, the rafting company did not tell Abromitis and his wife, Allison Parker, the river was running at more than 2,000 cubic feet per second because of snow melt runoff and additional flow released upstream, according to the lawsuit filed by Aspen attorney Alan Feldman. Finally, the raft guide on the trip “acted in conscious and reckless disregard for the life and safety of the customers on the raft by purposefully paddling” into a large hole in the river created by an underwater obstacle or boulder, the lawsuit states. The raft became stuck in the hole and Abromitis was ejected and “washed through the entire length of the rapid,” according to the lawsuit. The raft made it out of the hole and eventually caught up to Abromitis. Jeremy Wallace, The Aspen Times’ photographer at the time, happened to be on the same boat as Abromitis and his wife shooting rafting video, and said afterward that he and another man spent about 20 to 30 seconds pulling Abromitis back into the boat after they escaped the hole. The lawsuit claims a safety kayaker with the trip provided no help to Abromitis. However, Wallace said at the time that the kayaker was able to catch up to Abromitis, though it was in a “terrible section” of the river, and Abromitis was struggling quite a bit at the time. “Video taken by a reporter on the raft shows (Abromitis) to be in shock, hypothermic and in a state of acute distress,” the lawsuit states. “Inexplicably, the raft guide jumped out of the raft and made no effort to rescue Mr. Abromitis once they reached him. Seconds later, however, the raft slammed into a large downed tree, known as a strainer, and a boulder, dumping Abromitis, his wife and another man into the river, Wallace said at the time. “The raft guide managed to save himself by climbing up onto the tree, but did not help anyone else,” the lawsuit states. “Mr. Abromitis was flushed downriver through the next rapid while the raft guide stood on the tree watching him disappear. Wallace said at the time he was told the river was running at 1,600 cfs. Ingram released a statement after the incident two years ago, saying that his guides “responded immediately,” pulled Abromitis out of the water and began emergency life-saving procedures. The lawsuit accuses Aspen Whitewater of causing wrongful death, gross negligence, violating the Colorado Consumer Protection Act and fraud.